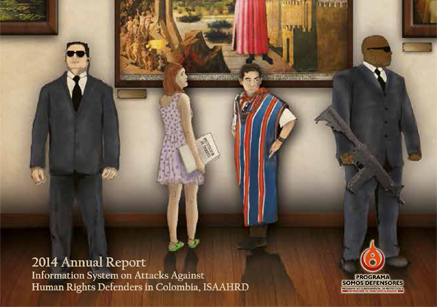 The Non-Governmental Program for the Protection of Human Rights Defenders – We Are Defenders (Programa no Gubernamental de Protección a Defensores de Derechos Humanos – Somos Defensores) has published its 2014 annual report entitled “The Divine Comedy”. The Non-Governmental Protection Programme Human Rights Defenders has registered attacks on defenders since 2010, and 2014 was year with the highest number of attacks so far: 626 defenders were attacked (71% higher than in 2013) and 212 social and human rights organisations. In September alone, 26% of these attacks were carried out, after President Santos took up office for a second term. The acts of aggression which occurred throughout the year included 488 threats, 41 attacks, one enforced disappearance and 10 thefts of information. There were 55 murders, and in 31 of these cases threats had been previously reported, demonstrating the absence of inadequacy of protection measures. In addition, there were 23 arbitrary arrests and on 8 occasions the criminal justice system was used arbitrarily against defenders. Compared to 2013, the largest increase was in the number of threats, which increased from 209 to 488, with 15 mass threats between September and December 2014. The pattern of phantom threats continued from paramilitary groups such as the “black eagles”, and “los rastrojos”, among others. These threats have been particularly linked to the participation of victims in the peace talks in Havana and to land restitution cases. In general, the Public Prosecutor’s Office has been unable to find those responsible. Moreover, the theft of information from human rights defenders rose from 3 cases in 2012 to 10 cases in 2014; cases included thefts of computers and electronic espionage. Clandestine intelligence offices were used, such as the “Andromeda” office, comprised of civilians and members of the military intelligence corps. The attacks in 2014 were alleged to have been perpetrated in 72% of cases by paramilitary groups, in 19% of cases by unknown individuals, in 7% of cases by the State security forces and in 1.5% of cases by the guerrilla. The area where most attacks occurred, especially threats, was in the capital, Bogotá. Most national human rights organisations are based in this city.